Our golf management program is one of only 18 PGA-accredited programs in the country and the only one in Florida. The 4 to 4 1/2-year curriculum provides students with the skills and knowledge they need to succeed as golf professionals in a variety of careers. Upon completion of the university's requirements, PGA requirements and 16 months of internship, students are eligible to become Class A PGA members upon graduation. Students benefit from 300+ Class A PGA professionals in the region who provide formal mentorship, employment opportunities and lend their expertise our classrooms. To further enhance your prospects, consider a dual major in Resort & Hospitality Management or minor in a number of business concentrations such as Management, Marketing, Entrepreneurship or Real Estate. An integral part of our program is 16-plus-months of formally structured, paid internship. Our local PGA Professionals make our program truly special. Located in southwest Florida with over 140 courses within an hour of campus. The PGA of America is offering scholarship awards of $8,000 each to up to five students from diverse backgrounds pursuing a PGA Golf Management University Program degree. Earn your bachelor’s degree in a golf industry compatible major, have the ability to apply for PGA Membership, and earn the right to wear one of the most recognized logos in sports. High school seniors, high school graduates or current undergraduates planning to enroll in, or already enrolled in, fulltime undergraduate study at one of the 18 accredited PGA Golf Management Universities for the entire 2018-19 academic year are encouraged to apply. For more information contact Tara McKenna. PGA Golf Management is a limited-access program. 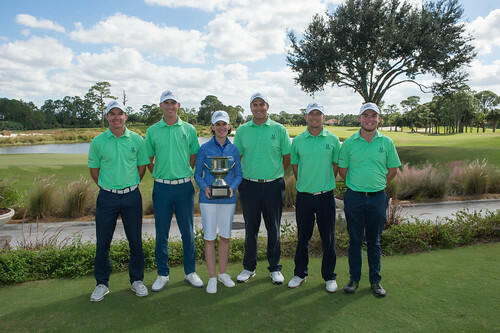 In addition to meeting the standard requirements of the university (for details, visit fgcu.edu/admissions), students must submit a separate application to verify their handicap (12 or lower USGA handicap) through the PGA Golf Management Program. Qualified students are admitted in the fall semester on a space-available basis. Admission decisions are based on materials and coursework completed at the time of application. For priority consideration, all materials must be received by April 1 of the calendar year in which entry is sought. PGA Golf Management teamed up with Occupational Therapy for the first ever "Research Roadshow"